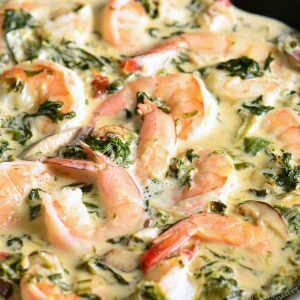 Fast and easy Shrimp Florentine makes a perfect weeknight dinner because it’s ready within 20 minutes. Juicy shrimp is cooked with spinach, mushrooms, shallots, sun-dried tomatoes, and white wine cream sauce. So much flavor is packed into one simple shrimp dinner. Serve it with any pasta or green vegetables. Another recipe that is worth checking out is my Salmon Florentine. It features similar flavors and made with juicy, baked salmon. If you can’t get enough seafood and spinach, try this Stuffed Salmon and Seafood Ravioli dish. Florentine, or a la Florentine, is referred to as a style of cooking that came from Florence, Italy. These dishes prominently feature spinach and cream sauce. 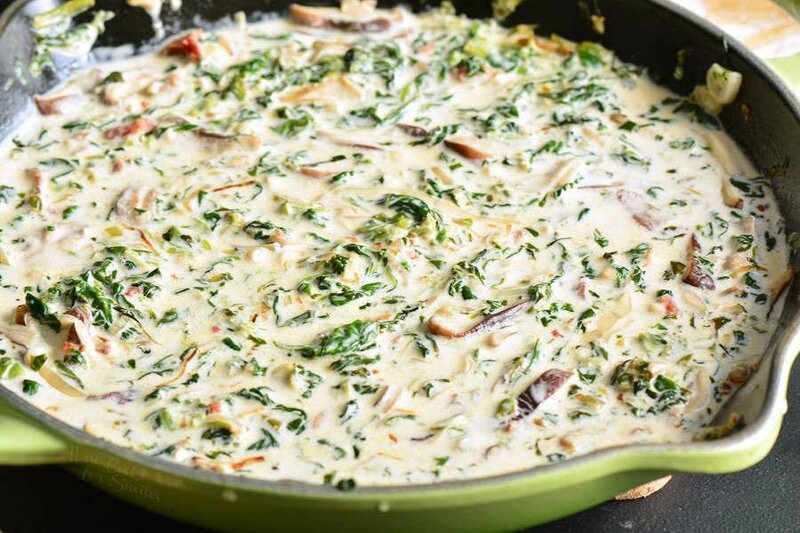 Most often, Florentine is a preparation style for eggs, fish, and chicken. The main ingredient that shines in every Florentine recipe is spinach. Sometimes, you will find mushrooms, artichokes, or white beans as well. Along with spinach, there is usually a cream sauce present. Florentine dishes feature a basic béchamel white sauce but may have some simple variation such as addition of cheese. For my Florentine dishes, I like to add white wine to the sauce and give it a little French twist. I’ve gotten a lot of comments on my Salmon Florentine recipe asking how can people make this dish lactose free without compromising the tastes. Those of you who need to stay away from dairy/lactose will be happy to know that you can enjoy this Shrimp Florentine (and Salmon Florentine) and substitute heavy whipping cream. I’ve made both dishes without heavy whipping cream and both times, I barely even noticed the difference. To substitute heavy whipping cream, I recommend using lactose-free whole milk, such as Lactaid or another brand, and a little bit of cornstarch for thickening. Only a little bit of cornstarch is needed, just 1-2 teaspoons. Make sure to mix cornstarch into cold heavy cream or chicken stock before adding it to the pan. CAN IT BE MADE WITHOUT WINE? Technically, yes this dish can be made without wine. There is no substitution that will make it taste the same so wine can be simply omitted. 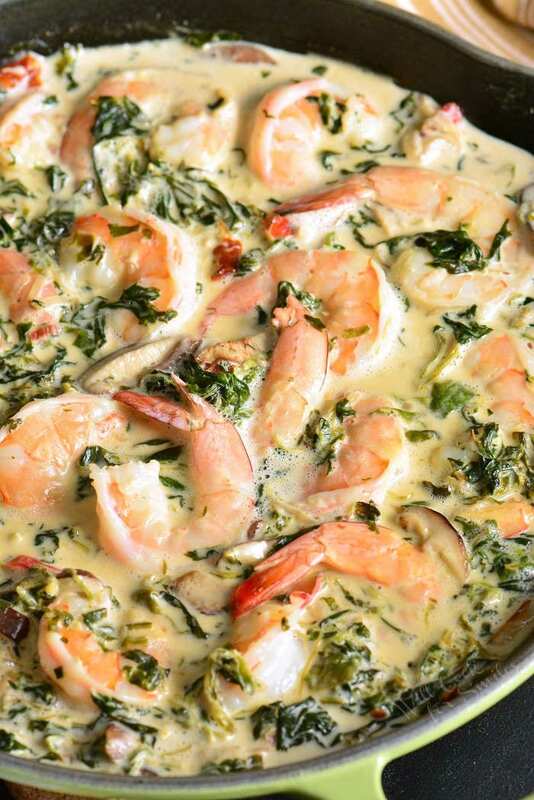 This will still be a delicious Shrimp Florentine, the sauce will just taste a bit different. 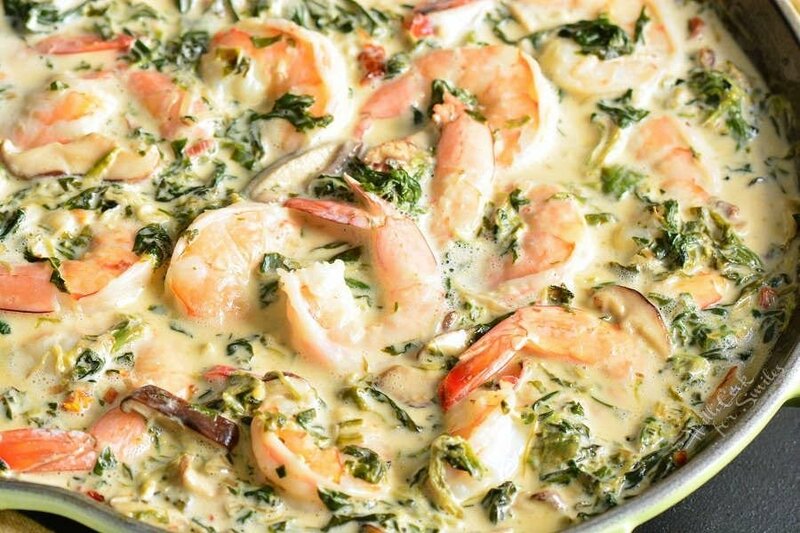 WHAT TO SERVE WITH SHRIMP FLORENTINE? Shrimp Florentine can be served over fettuccine or another pasta. Another wonderful and comforting addition to this dish is some fresh Italian bread or some garlic bread. It will complement the dish well and bread will help soak some of this delicious sauce. If you want to keep is healthier, serve it with some green vegetables like green beans, broccoli, or asparagus. Crunchy vegetables are great served in this creamy sauce. As a grain option, you can serve this over quinoa or farro. Juicy shrimp is cooked with spinach, mushrooms, shallots, sub-dried tomatoes, and white wine cream sauce. Peel and devein the shrimp if needed. 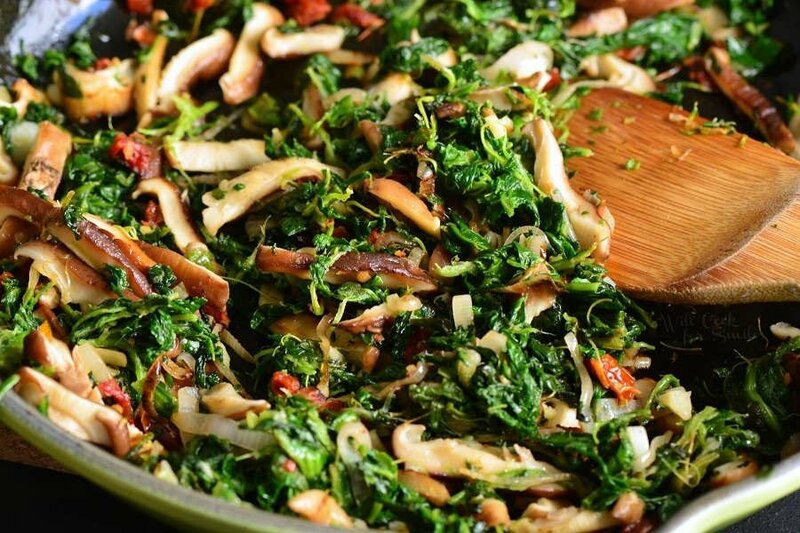 Squeeze liquid out of spinach, slice mushrooms and shallots, dice sun-dried tomatoes, smash and mince garlic cloves. Preheat a large cooking pan over medium heat. Add oil. Add sliced onions and saute until softens. Add spinach, mushrooms, and tomatoes. Cook for a few minutes, until mushrooms start to soften. Add garlic, mix, and cook until fragrant. Pour in white wine and let it simmer for about 5 minutes to let the alcohol cook out. Stir in heavy whipping cream and chicken broth. Season with salt and pepper and bring the mixture to simmer. Nestle shrimp in the pan among the veggies and sauce. 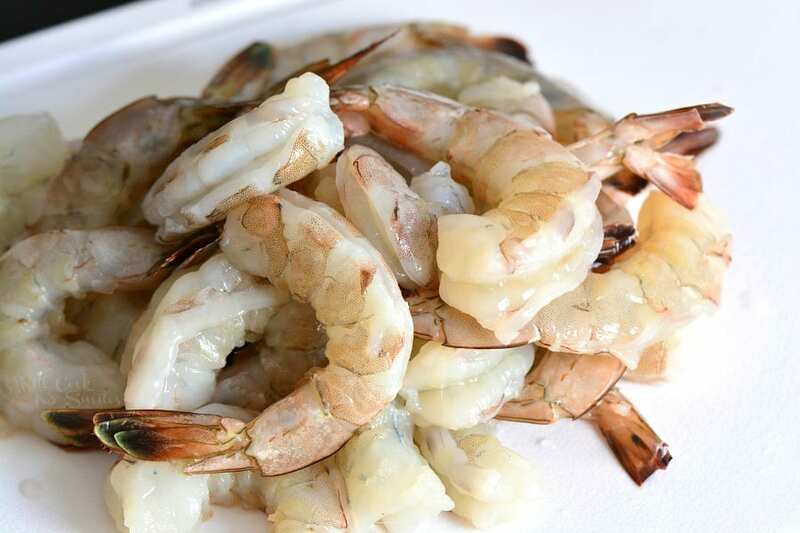 Cook until shrimp turns pink and opaque on one side and flip. Cook until shrimp turns pink and opaque on the other side as well. Take off heat and serve.